Come celebrate the darkest season with live music, comedy from MC Dutch Savage, and an opportunity to get your picture taken with Krampus, mall-santa style (buy a shot, get a shot with Krampus) - so be sure to wear your ugliest ugly Christmas sweaters! The roundup for our second annual Krampusfest Holiday Revue is: Blood Gnome (elusive all-femme synthpop creeps from Eureka in their bi-annual live appearance), The Hand of Dr. Foxmeat Paints a Monochromatic Rainbow (danceable wizardcore from Arcata), Opossum Sun Trail (haunting spaghetti-westerncore), a "mall Krampus," punmaster Dutch Savage, and more TBA? 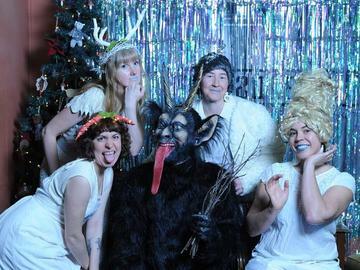 Friday, December 14th / pics with Krampus at 8:00 pm / comedy & music starting at 9:30 pm / 21 & up, must show valid ID. *Who is Krampus, you ask? Krampus is a goat-horned creature in German, Austrian, Hungarian, and Czech folklore, a counterpart to St. Nicholas but with roots in pre-Christian pagan tradition. He leaves naughty children sticks instead of presents in some traditions, and if they're especially naughty he steals them away to the Underworld (so be nice! ).